When I got the three volumes home, I made a surprising discovery: They were all published at roughly the same time, in 1948 and 1949. What are the odds of that? Perhaps it means nothing—just the long arm of coincidence reaching out to tap me on the shoulder. On the other hand, maybe there was something in the air circa 1950, something that made the period unusually fertile for studies of information, communication, and computation in brains and machines. I have done a little digging in library catalogues and Wikipedia, as well as in my own files, looking for other titles that might belong on this list of distinguished midcentury milestones. Gilbert Ryle’s The Concept of Mind is another 1949 title, though I’ve never read it. Also from 1949: Nicholas Metropolis and Stanislaw Ulam published the first open account of the Monte Carlo method. Warren S. McCollough and Walter H. Pitts, “A logical calculus of the ideas immanent in nervous activity,” 1943. John von Neumann and Oskar Morgenstern, Theory of Games and Economic Behavior, 1944. Erwin Schrödinger, What Is Life? The Physical Aspect of the Living Cell, 1944. Vannevar Bush, “As We May Think,” 1945. I acknowledge a further reason for caution when I cite 1949 as a year of special distinction. It’s my year, the year of my birth. 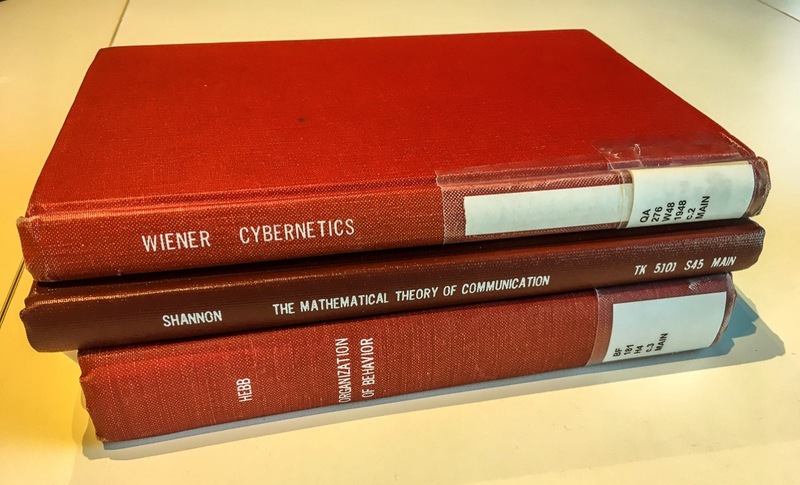 I’m not sure about Hebb and Ryle, but certainly Wiener and Shannon’s work, as well as Zipf’s paper, made a big splash at the time, so not surprising they would stimulate a lot of work, or even feed off one-another, given the relative newness of information theory. Similarly, a few years later (1956) George Miller’s classic paper, “The Magical Number Seven, Plus or Minus Two: Some Limits on our Capacity for Processing Information” appeared and generated a lot more interest (and papers) within psychology. I suspect any brief time period might show a cluster of scientific work around certain newly-introduced ideas… though whether it is lasting, or a flash-in-the-pan, may vary. While the sputnik shock was later, and individualists like Shannon possibly did their own thing anytime anyhow, could it be related to the beginning of the cold war, the notion that signal processing in its widest form had enormous impact in World War II, and the anticipation that it will be even more important in the future, that triggered these activities? I think the later Macy conferences focused around cybernetics were clearly related to what now is called military-industrial complex, and endorsed because of their potential importance in getting ahead of the Russian’s in technical terms. Seems like a group intellectual burst after the end of World War II. Nothing like a war to jiggle one’s thought processes. If you are interested, there is an interesting book about the history of information theory “The Information A History, a Theory, a Flood” by James Gleick that may answer a few of your questions. Also in 1949, the famous book, Principles of Animal Ecology by Allee, Emerson, Park, Park and Schmidt (the Great AEPPS) was published as was Simpson’s The Meaning of Evolution and Schmalhausen’s Factors of Evolution–all influencing or foundational to ecology and evolution today.